We can ID this sparrow as the rufous variety of the Field Sparrow by its pinkish, short and conical bill; pinkish legs; rufous crown; white eyering; rufous marking behind eye; rufous and brown upperparts with streaks; buffy breasts and two whitish wingbars (you can just make out the edge of the wingbar on the left, the rest is blocked by a branch). The Field Sparrow is a partial migrant. Northernmost breeders move South in the fall; southernmost breeders may move only a short distance or may be permanently resident. In spring in the northern areas, males arrive 2-3 weeks before females. 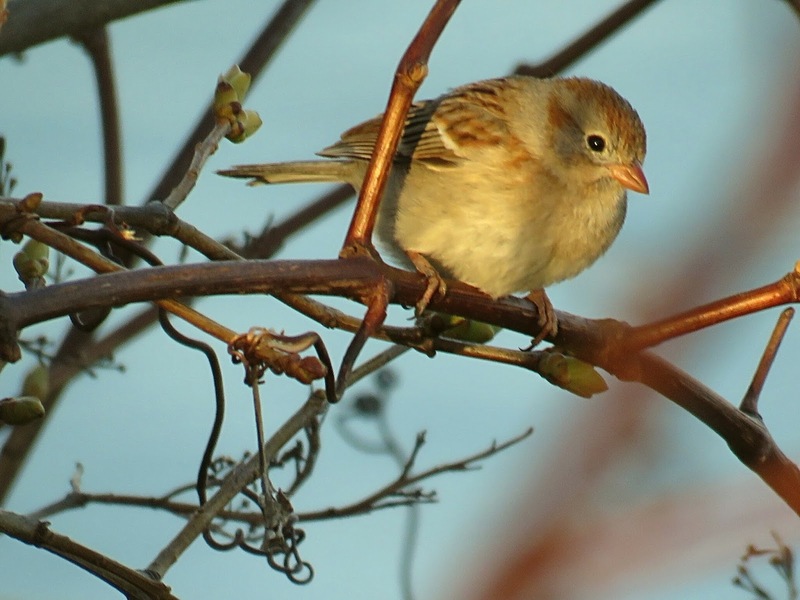 The Field Sparrow is a new species to our Photographic Life List, which now stands at 781.